You might be wondering what the difference is between creamy scalloped potatoes and au gratin potatoes? 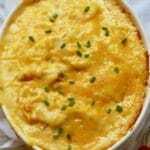 Usually, in addition to a cheesy filling, au gratin potatoes are cooked in a shallow dish and topped with a toasty breadcrumb topping. Scalloped potatoes, on the other hand, technically are only made with cream and not cheese. 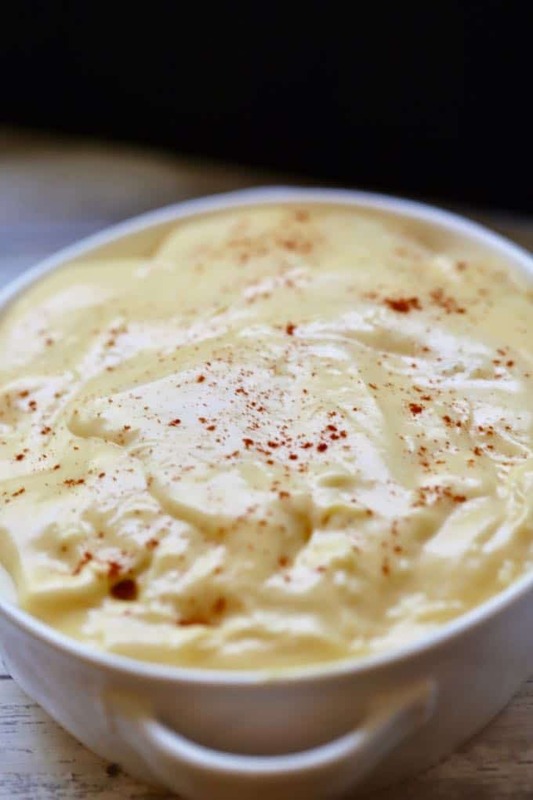 Over the years cheese lovers have blurred the lines and probably half of the recipes you will see for scalloped potatoes also include cheese! I’ve even seen the term: scalloped potatoes cooked au gratin style! No matter what you call them, easy cheesy scalloped potatoes are a kid-friendly, family favorite and the perfect side dish. They pair well with just about any entrée and, well, they are delicious! 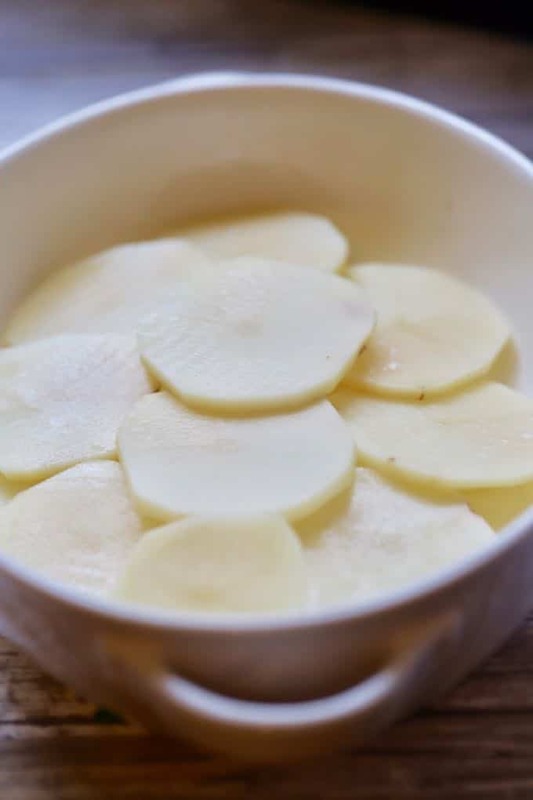 A common question is what potatoes are best for scalloped potatoes? I prefer russet potatoes because I think the extra starch in russets makes the sauce a little creamier. You can also use Yukon Gold, but the texture will be a little different. I also almost always leave the peel on, but most recipes call for peeled potatoes. 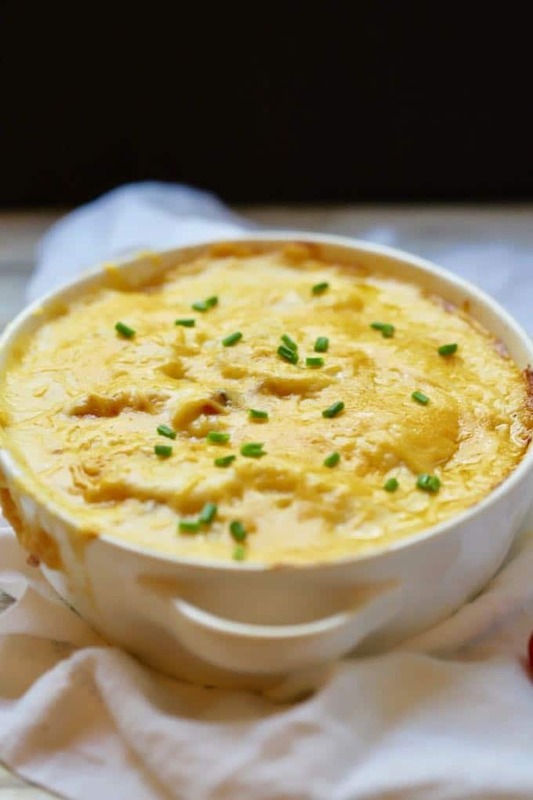 If you like this Southern-style potato side dish, you might also like these recipes: Easy Au Gratin Potatoes and Ham, Ultimate Blue Cheese Potatoes Au Gratin, and Creamy Make-Ahead Mashed Potatoes. Gather the ingredients, slice the potatoes and preheat the oven to 350 degrees F.
Melt butter in a medium-size skillet over medium-low heat. Add garlic and cook for about 30 seconds. Add the flour and whisk until smooth. Cook for about 1 minute, whisking constantly. Add the milk. Continue whisking until the mixture is smooth and lump free. Add the salt, red pepper and nutmeg. 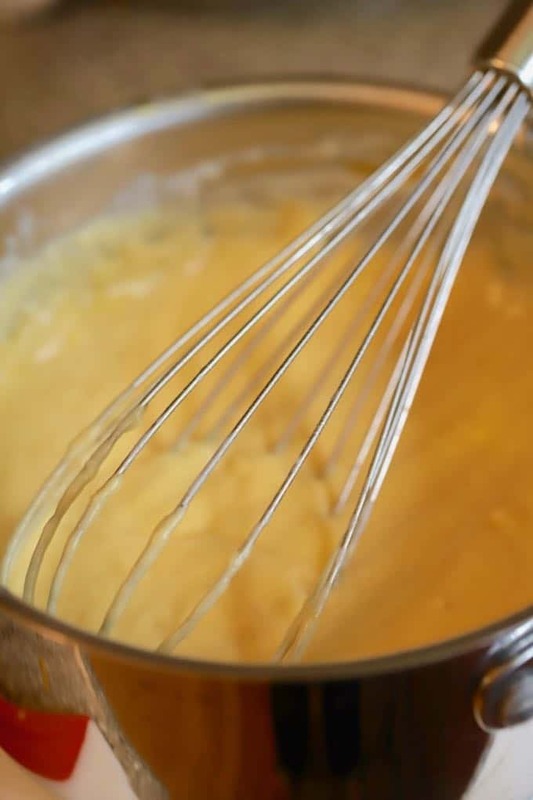 When the mixture comes to a boil and thickens, reduce the heat to low and add 1-1/2 cups of cheddar cheese. Once the cheese has melted, remove the skillet from the heat and set aside. Spray a 2-quart baking dish with non-stick cooking spray. Add half of the sliced potatoes and spread them out evenly. 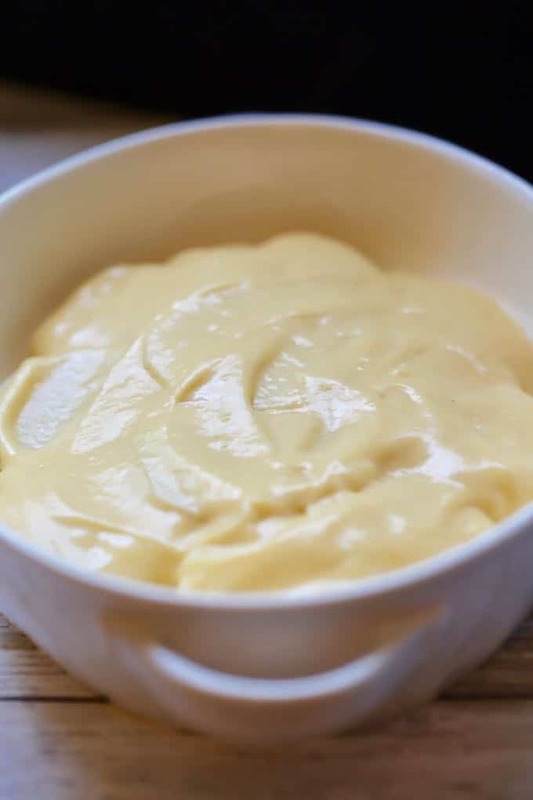 Pour half of the cheese sauce over the potatoes. Repeat with the second layer of potatoes and cheese sauce. Sprinkle the remaining cheddar cheese evenly over the top and add the parmesan cheese. Cover the dish with a lid or aluminum foil and bake for 45 minutes. Uncover and bake for another 15-20 minutes or until the potatoes are fork tender. Optional, top with a small pinch of paprika or chives for color. Serve immediately. 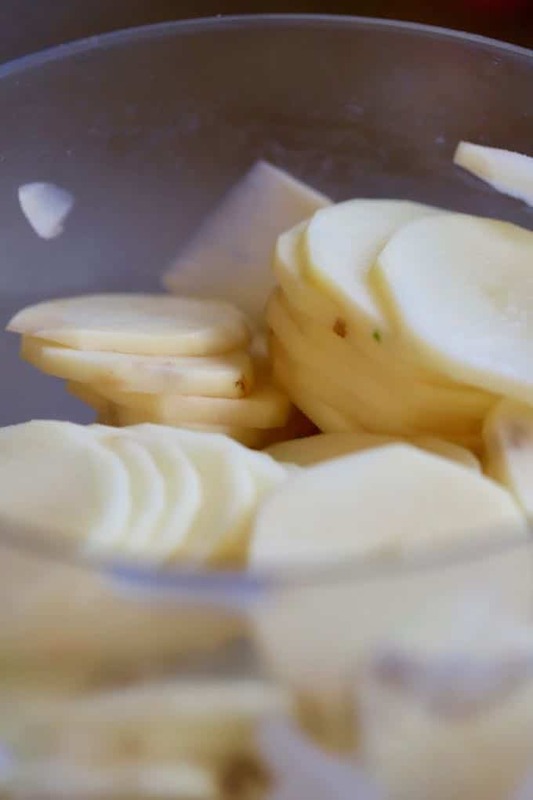 *For the best results, slice the potatoes approximately 1/8-1/4 inch thick using a mandolin, food processor or sharp knife. If the potato slices are thicker, you will need to increase the cooking time. 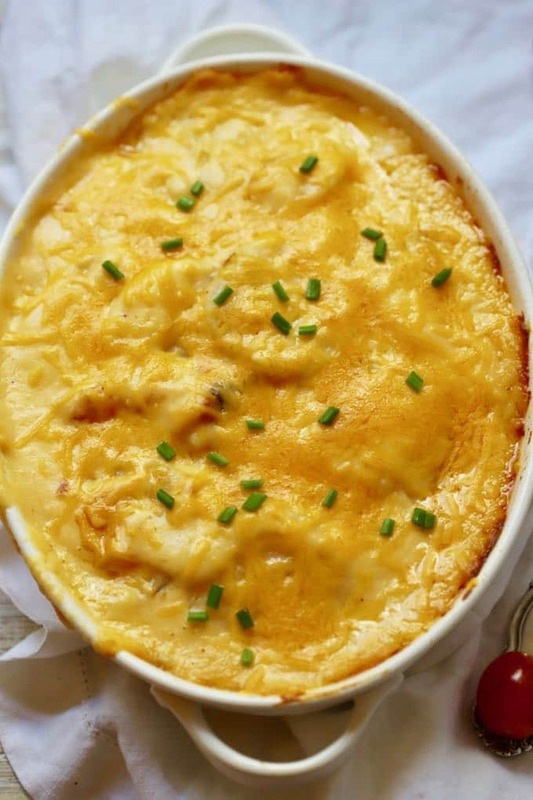 Southern Cheesy Scalloped Potatoes, an Easter bunch or dinner tradition especially in the South, consisting of sliced potatoes covered in a decadent and rich cheesy bechamel sauce and then baked until they are melt-in-your-mouth tender. Spray a 2-quart baking dish with non-stick cooking spray. Add half of the sliced potatoes and spread them out evenly. Pour half of the cheese sauce over the potatoes. Optional, top with a small pinch of paprika for color. Serve immediately. I made this for Easter and it was delicious! This was the first time I made scalloped potatoes (not out the box lol) and it was so easy and they turned out great! I even had the pleasure of making this for the blogger herself. Thanks Sharon for having a great and easy recipe for me to make! Hey LeighAnn, you did a great job and they were absolutely delicious as was the entire dinner! Thank you so much for having us! Simply delicious. I always appreciate a recipe that only requires ingredients that I am likely to have on hand. With ham and pole beans, it was the perfect southern meal! Hey Susan, I’m so glad you enjoyed it! It’s one of my favorites too!